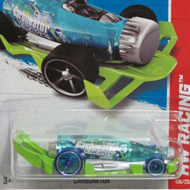 17/250 is part of the HW City and the 2013 Treasure Hunt set. 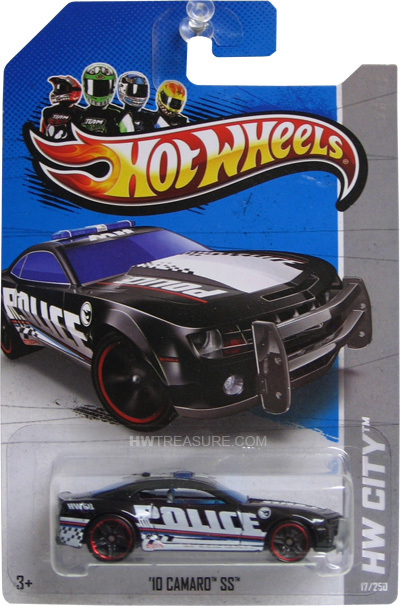 The black Camaro sports red & blue stripes, white graphics, “POLICE” on the sides and hood, “HW 68” on sides and roof, and the low production symbol on the sides. It has blue tinted windows and emergency lights, grey interior, black PR5 wheels with red chrome rims, and a grey plastic Malaysia base. 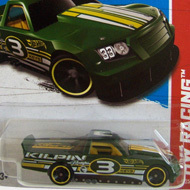 The car first appeared in the 2009 New Models series. It is based upon Chevrolet’s retro-modern vehicle with the same name.